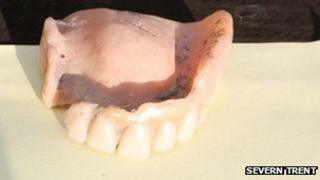 A utility company is trying to reunite nine people with their false teeth in time for Christmas. The dentures were all recovered from Severn Trent's sewage treatment works in Monkmoor, Shrewsbury. The teeth are thought to have been flushed down toilets or dropped down plug-holes. Pictures of the teeth have been posted on the company's website where people can view them and send a message if they recognise them. Ken Leah, who was a sewer worker in Shrewsbury for about 50 years and now spends time volunteering at the works looking after wildlife habitats, is heading the campaign. Mr Leah, who said he had seen all manner of rubbish flushed by residents, is hoping the campaign will remind people that items like teeth can block sewers and cause flooding. A spokesman for Severn Trent said the company spends over £10m each year cleaning sewers and clearing nearly 22,000 sewer blockages. Two-fifths of sewer blockages come from cleansing wipes and sanitary products and a further fifth come from fat, oil and grease. Other more common items found blocking sewers and drains include cotton buds, condoms, nappies, razor blades and plasters. Mr Leah said: "It's easy to think 'out of sight, out of mind' when we put items down the loo that would be better off in the bin, but for sewer workers on the receiving end of rubbish it's a constant battle. "A blocked sewer is, of course, inconvenient for our customers but if it leads to sewer flooding it can be extremely unpleasant and stressful. "When blockages and sewer flooding are caused by misuse of sewers and drains, they can be completely avoided."